The Intercare Touch-up Mini Vacuum cleaner Touch up mini vacuum sweeper is the convenient solution to spot cleaning. 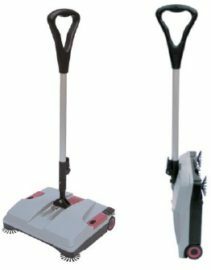 It is the ideal tool for low-pile carpets and rugs, but equally at ease on hard floors even with wide and deep grooves. Particles up to 2cm can be picked up. With an optional second battery 90 minutes of autonomy can be achieved.